Surfing’s elite performers will return to KwaDukuza for a seventh successive year when the Ballito Pro presented by Billabong, a QS10,000 rated event on the World Surf League (WSL) Qualifying Series (QS), runs from 29 June to 5 July. The third of nine events that carry the highest ranking on this year’s QS, the Ballito Pro offers a US $250 000 (approx. R3 million) prize-purse and an invaluable 10 000 points on the world rankings. It will feature a 96-man field of the world’s best surfers from every corner of the planet, all of whom are striving to qualify for a spot on next year’s WSL Championship Tour (CT). Continuing its 46 year legacy as the world’s longest running professional surfing event, starting when Port Elizabeth teenager Gavin Rudolph won the Gunston 500 in 1969, all aspects of the Ballito Pro will be bigger and better this year with the support of global apparel and equipment giant Billabong which has come onboard as presenting sponsor for the main event and the trials. With more than a month to go until it closes, the entry list already includes a dozen CT surfers, headed by current world No. 9 Jordy Smith, along with another 40 highly rated competitors from 15 countries. Smith, the 2010 event winner and 2013 runner-up, grew up in Durban and is always happy to compete in his home surf. The event provides the local WSL Africa registered surfers with the priceless opportunity to earn prize-money and highly coveted rankings points with the advantage of competing in their home surf. 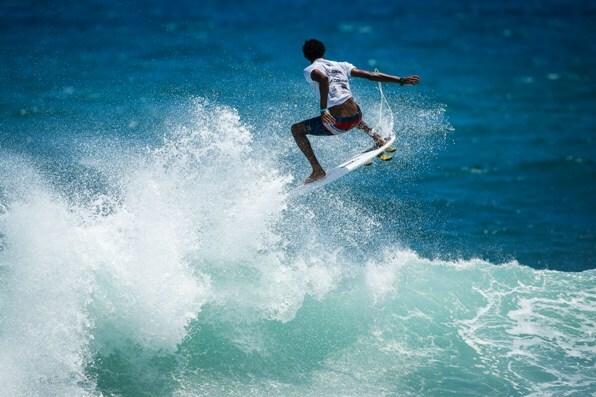 While the surfers ride the waves, the Ballito Pro Festival is set to turn up the heat in KwaDukuza offering the best in beach, music and extreme sports entertainment. Locals and holiday-makers will be spoilt for choice with an action packed programme planned for the week-long festival that includes: daily doses of beach soccer and volleyball, regular stage performances by local dancers, singers and performers and an exciting retail area. In addition to this, the extreme sports programme is guaranteed to thrill with Freestyle Motocross displays by Monster Le Riche brothers; a Monster Surf Expression Session powered by Zig Zag and a Monster Beach Surf Movie Night. Crowd favourite, the Coastal Living Bru Food & Wine Festival, returns to La Montagne for a ‘flavoursome’ few nights, playing host to the artisan food market, a wine and coffee showcase and the return of the popular cooking competitions. Music lovers won’t be disappointed either with 5FM taking over the music reigns, bringing some of South Africa’s most talented music acts to the stage with Crush Night Club after-parties continuing the celebrations late into the night. The World Surf League (WSL) organizes the annual tour of professional surf competitions and broadcasts each event live at WorldSurfLeague.com where you can experience the athleticism, drama and adventure of competitive surfing — anywhere and anytime it’s on. The WSL sanctions and operates the following tours: the Junior Tour, Longboard Tour, the Qualifying Series (QS), the Big Wave Tour and the crown jewel of the sport, the WSL Championship Tour (CT) which determines the sport’s undisputed world champions. The organization is headquartered in Santa Monica, California with Commercial Offices in New York. The offices are supported by regional centres in Africa, Asia, Australasia, Europe, Hawaii, North America and South America. The Ballito Pro and the Ballito Pro Trials are registered with Surfing South Africa, recognised by the Dept. of Sport and Recreation as the national controlling body for the sport and a member of the SA Sports Confederation and Olympic Committee (SASCOC). 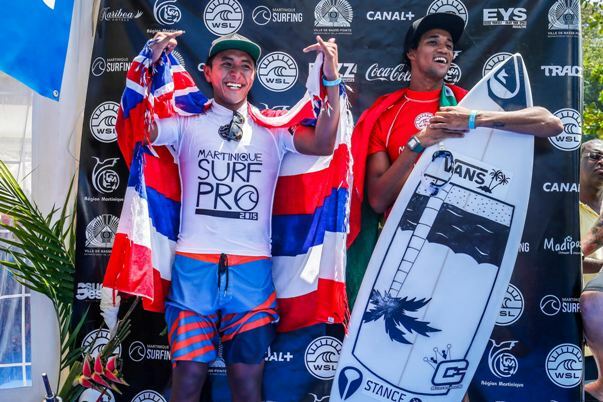 South Africa’s Michael February finished runner-up to Joshua Moniz (HAW) in the inaugural Martinique Surf Pro, a QS3 000 rated event and the eighth stop on the 2015 World Surf League (WSL) Qualifying Series (QS), on Saturday. The result, February’s best in three years on the QS, earned the 21 year-old from Kommetjie US $10 000 (approx. R120 000) and 2 250 points which saw him rocket up 61 places to No. 16 on the latest rankings, the highest by a South African. February, who posted one of the only two perfect 10 point rides in the event during the Quarters on Friday, did not let an excellent score by Moniz on the first ride of the Final alter his motivation and kept battling all the way to the final countdown in search of the 9.37 he needed to take the win. Moniz, 18, could not have started the final any better, catching an excellent wave in the opening seconds, to deliver a series of exciting forehand turns and collect a 9.07. The Hawaiian didn’t take his foot off the gas and continued to capitalise on every opportunity he got to finally net an 8.87 as a backup and win the event. Despite posting big scores all week, Moniz was in the underdog position up until his quarterfinal matchup where he dispatched South Africa’s Beyrick De Vries (Umhlanga), 22. The Hawaiian then emerged as a potential threat for the event crown, and convincingly surfed two more brilliant heats to take the title home. February opted to go local in terms of accommodation and stayed with a Martinican family to immerse himself into the local vibe. Supported during all his heats by an excited crowd, February has won the hearts of many Basse-Pointe locals today. In his Semifinal February surprised everyone including himself when needing 7.70 with just seconds remaining he elected to ride left on the righthand point. Taking to the sky as the wave closed out, he successfully landed a high-flying ‘Hail Mary’ 360 aerial manoeuvre that the judges rewarded with 7.87 and gave him a berth in the Final. Cooper Chapman (AUS), 20, fell short of a mere 0.34 in second Semifinal after an exciting final exchange with Moniz in the last moments of the heat. Chapman improved both his counting rides including an impressive 9.03 on his final wave, but he couldn’t match Moniz’s flair and rhythm. South Africa’s de Vries finished equal fifth when he was eliminated in the Quarterfinals while Dale Staples (St Francis Bay) and Dylan Lightfoot (Jeffreys Bay) finished ninth and 13th respectively after Round 5 exits. Mikey February (Kommetjie) and Beyrick de Vries (Umhlanga) recorded the only perfect 10 point rides of the inaugural Martinique Surf Pro as a quartet of South African surfers made a strong showing on Day 4 of the first World Surf League QS3000 event to be run in the Caribbean. Friday’s action ran in excellent 1 to 1.5 metre waves at Basse Pointe with all four South Africans advancing from Round 4 to the last 16 in Round 5. February, Dale Staples (St Francis Bay) and Dylan Lightfoot (Jeffreys Bay) were all safely through before de Vries blew up with the highest heat total of the day. Starting his heat with a mid-range score, de Vries then decimated a long wall with searing rail work and progressive fins-free turns to earn the first perfect 10 point ride of the event. Two rides later he added a 9.0 for a near perfect heat tally of 19.0 out of 20. De Vries also racked up the highest heat total of Round 5, waiting patiently for the best waves and then producing error-free, high-risk surfing that was rewarded with an 8.07 followed by a 9.0 and then a 9.67 that gave him a two-wave tally of 18.67 and a berth in the Quarterfinals. February sneaked through his Round 5 heat with a 7.33 and an average 4.33 that was just enough to give him second place and a spot in the last eight while Lightfoot, fourth in his heat, and Staples, third in a high scoring encounter behind de Vries and Thiago Camarao (BRA), were eliminated from the event. The format changed to man-on-man heats for the Quarters and February got off to a spectacular start with a turbo-charged ride on one of the biggest waves of the day. Taking off deep in the lineup, the lanky 21 year-old swooped through a series of top to bottom carves punctuated by arcing cutbacks and finished with a committed re-entry that the judges awarded a perfect 10. Adding a 7.17 soon thereafter, MFeb was able to cruise during the second half of his encounter, using priority strategically to keep his dangerous opponent Francisco Bellorin (VEN) from catching two waves with high scoring potential. February will take on Miguel Tudela (PER) in the Semifinals when the contest resumes. De Vries stayed patient in his Quarterfinal while Joshua Moniz (HAW) built up a sizeable lead before the South African posted his first good score, a 7.50. Moniz continued to find the better waves and de Vries was left needing a near-perfect 9.77 when the heat ended, finishing the event in equal fifth place overall. Moniz will contest the second Semifinal against Cooper Chapman (AUS) who narrowly defeated Camarao in their clash. South African Bianca Buitendag (ZAF) placed equal fifth overall in the Drug Aware Margaret River Women’s Pro in Western Australia as Courtney Conlogue (USA) clinched victory at the third stop on the Samsung Galaxy World Surf League (WSL) Championship Tour (CT) on Wednesday. With Main Break continuing to offer double overhead waves and stiff offshore winds organisers had no hesitation in getting the Quarterfinals underway this morning and the world’s best female surfers fought through an exciting Finals day. Buitendag’s quarterfinal match-up with Malia Manuel (HAW) started slowly with the Hawaiian recording a pair of mid-range scores and the South African just a throw-away 0.57 in the first 20 minutes. A series of powerful sets rolling through the break saw the rest of the 30 minute heat produce a back and forth duel as Buitendag grabbed the lead with scores of 7.0 and then 7.60 to put Manuel into a combination situation. But the Hawaiian kept her composure and answered back with a 5.13 and a 6.90. Needing 7.70 for the heat win and a berth in the semis, Manuel found a great wave in the dying minutes and finished her ride with a powerful re-entry to post an excellent 8.50. Buitendag was unable to find the 7.81 she needed and was eliminated. Her fifth place result earned 5 200 points which combined with her 13th and ninth place results in the opening two events of the year saw the 21 year-old from Victoria Bay move up one spot in the WSL rankings to No. 11. The Final produced an epic showdown with Conlogue claiming her third CT victory and ending the amazing run of form from two-time World Champion Carissa Moore (HAW). The win today sees Conlogue steadily improve on her performance this year, having previously claimed fifth place on the Gold Coast and a third at Bells Beach. The result moves her to second place on the WSL rankings going into the fourth event of the year, the Oi Rio Pro next month. Conlogue drew first blood in the Final for a modest score, a 5.33, and an early lead. An uncharacteristic priority mistake from Moore with 20 minutes remaining left Conlogue with her pick of the waves but Moore came back to take an inside wave, unload two big turns and earn an excellent 8.50. The Californian answered back with a big layback hack to reclaim the lead and then took a set wave for an excellent 8.43. The Hawaiian was left without priority needing a 6.60 and found only a 4.63 at the six-minute mark. 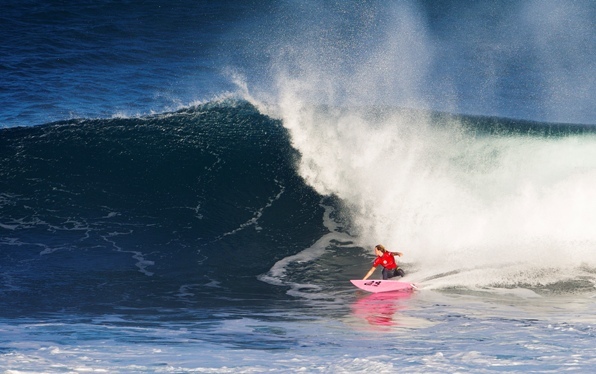 Conlogue had four minutes remaining to control the lineup and hold off the two-time World Champion and found a big righthander, delivering three solid terms to improve her scoreline with an 8.50, and take the win. The second-place finish today from Moore and her third consecutive final of 2015 sees her retain the Jeep leader yellow jersey and no. 1 spot on the rankings. Moore, who got the better of Tyler Wright (AUS) in both 2014 and 2013 to claim consecutive victories at Margaret River, defeated both Sally Fitzgibbons (AUS) and Tatiana Weston-Webb (HAW) before facing Conlogue in the Final. The Drug Aware Margaret River Pro runs from April 15 – 26, 2015 and the men’s Semifinals will get underway when competition resumes. Watch the unparalleled adventure, competitive drama and athleticism of professional surfing live at WorldSurfLeague.com. South African Bianca Buitendag charged her way through three gruelling 30 minute heats in double overhead waves at Main Break to reach the quarterfinals of the Drug Aware Margaret River Pro in Western Australia on Sunday. After the men’s Semifinalists in the third Samsung Galaxy World Surf League (WSL) Championship Tour (CT) event of the year had been decided in giant surf at the Box and Main Break on Saturday, organisers opted to run three rounds of Women’s competition earlier today, reducing the field of the world’s best female surfers from 18 to just eight. Buitendag started her campaign in the first heat of the day where she posted a pair of 7 point rides to edge Nikki van Dijk (AUS) and progress to a three-woman, Round 3 clash with Tyler Wright (AUS) and Courtney Conlogue (USA). Despite recording the highest single ride of that encounter – 8.83 out of 10 – Buitendag’s second ride was a mid-range 4.37 which saw her finish third in that heat and facing a Round 4 duel with Silvana Lima (BRA) for a place in the Quarters. The 21 year-old from Victoria on the Cape South coast started strongly against Lima, racking up successive 8 point rides through the middle of the duel. This put her opponent into a combination situation where the Brazilian needed to improve on both her scores, which she only managed to do in the last minute and was left needing another excellent 8.72 for the victory. Following 13th and 9th place finishes in the opening two events of the 2015 WSL CT, Buitendag has reached the last eight in an event for the first time this season. When competition resumes she will take on Malia Manuel (HAW) with the winner advancing to the Semis. Those who progressed directly to the Quarterfinals by winning their Round 3 match-ups earlier today were current ratings leader Carissa Moore (HAW), Sally Fitzgibbons (AUS), Manuel and Tyler Wright (AUS). They were joined by Round 4 winners Lakey Peterson (USA), Tatiana Weston-Webb (HAW), Courtney Conlogue (USA) and Buitendag. Reigning WSL Champion Stephanie Gilmore (AUS) was forced to withdraw from the competition following a knee injury sustained during a freesurf yesterday. More scans are required before she will know full extent of the injury but she’s hopeful of returning to competition at the next event in Brazil. Conlogue received a ‘walk-thru’ into the Quarterfinals following Gilmore’s exit. The Drug Aware Margaret River Pro runs from April 15 – 26, 2015. Watch the unparalleled adventure, competitive drama and athleticism of professional surfing live at WorldSurfLeague.com starting at approximately 1am SA Time daily. South African Jordy Smith (Durban) won his opening heat and advanced directly to Round 3 at the Drug Aware Margaret River Pro, the third stop on the Samsung Galaxy World Surf League (WSL) Championship Tour (CT) in Western Australia today. Huge waves reaching five metres at times greeted the world’s best surfers and the opening 7 heats of Men’s Round 1 saw the world’s best surfers tackling The Box, one of the world’s most challenging and infamous hollow waves. Smith, No. 5 in the WSL rankings coming into the event, was selective in his approach to waves at The Box in the second heat of the day, pulling into a couple of tube rides and finishing ahead of Jadson Andre (BRA) and Brett Simpson (USA) in a low-scoring 30-minute match-up. John John Florence (HAW), who won the Margaret River Qualifying Series event in 2012, opened the day’s competition with a 7.83 for his first wave. Florence threw himself over the ledge and demonstrated his skill and commitment to take a convincing Round 1 heat win. Despite some big wipe-outs Florence maintained his charging attitude to secure his place in Round 3, easily defeating Wiggolly Dantas (BRA) and Dusty Payne (HAW). Kelly Slater (USA), the 11-time World Champion, won his heat comfortably by charging fearlessly on multiple waves. Despite relatively low scores, with just a 4.50 and a 3.70 (each out of a possible 10), Slater delivered some amazing surfing in waves of consequence, putting himself on the line. 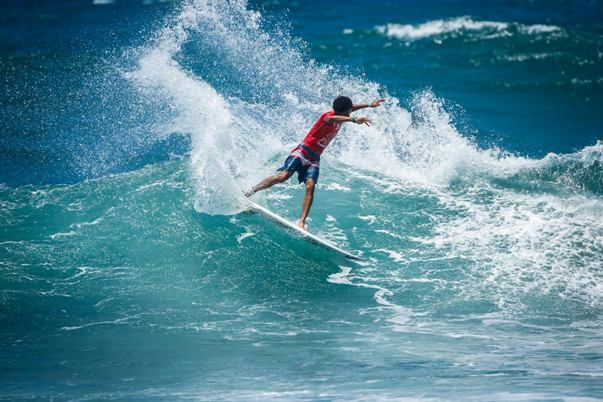 Slater defeated Kai Otton (AUS) and rookie Ricardo Christie (NZL) who will surf again in elimination Round 2. Three-time World Champion Mick Fanning (AUS) took to the water wearing the yellow Jeep rankings leader’s jersey following his win last week at Bells Beach and survived a tough heat against dangerous local surfer and trials winner Jay Davies (AUS) and Matt Wilkinson (AUS). Fanning opened early with an excellent 8.63 to control the heat and Davies challenged with a 7.50. Left needing a 6.50 to take the lead Davies couldn’t find the score and will face Gabriel Medina (BRA) in a highly-anticipated Round 2 match-up while Fanning moves through to Round 3. Medina lost his Round 1 heat earlier in the day to Freddy Patacchia Jr. (HAW). After a morning of deep tube rides and terrifying wipe-outs, a switch in wind direction saw the competition moved to Margaret River’s Main Break where the remaining heats of Round 1 were run in waves that featured triple-overhead faces. The remaining five heats of Round 1 saw Miguel Pupo (BRA), Jeremy Flores (FRA), Joel Parkinson (AUS), Michel Bourez (PYF) and Julian Wilson (AUS) use longer surfboards in the giant surf to post wins and earn a pass directly to Round 3. Parkinson looked in-form today in his heat against Adam Melling (AUS) and Kolohe Andino (USA). The 2012 World Champion locked in the day’s highest two-wave heat total, a 15.73 out of a possible 20, to secure the win and a place in Round 3. Defending event winner Bourez also won through his Round 1 bout, claiming his first heat win of the year, narrowly defeating Nat Young (USA), who will now have to surf again in Round 2 along with rookie Italo Ferriera (BRA). Very solid SW groundswell will continue on Thursday, easing through Friday. Another exceptionally strong SSW groundswell is on track for Saturday, and could be even larger than the surf for Wed/Thur. Sunday will see dropping surf, with a further drop in surf on Monday. Morning wind conditions look favourable for the next few days, with some periods of side or onshore flow in the afternoons. Going further out, another strong SW swell looks possible around Wednesday the 22nd. 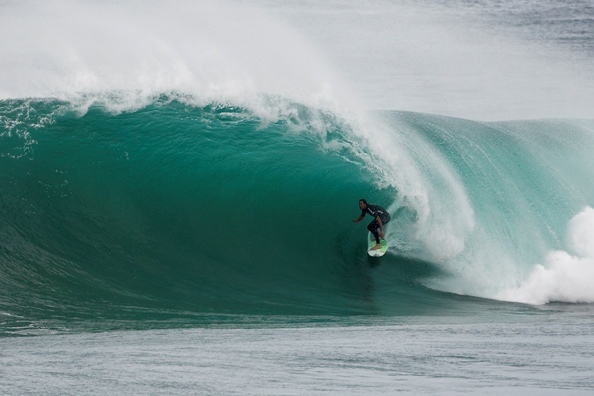 The Drug Aware Margaret River Pro will be held from April 15 – 26, 2015. Watch the unparalleled adventure, competitive drama and athleticism of professional surfing live at WorldSurfLeague.com. South African Jordy Smith placed fifth in the Rip Curl Pro Bells Beach after advancing to the Quarterfinals at the second stop on the 2015 Samsung Galaxy WSL Championship Tour (CT) before being eliminated by eventual winner Mick Fanning (AUS) in wind affected 1.5 metre waves earlier today. Smith’s haul of 5 200 points moved him up four places to No. 5 on the WSL CT rankings with two of the 11events on the 2015 schedule now completed. Fanning is now tied with Kelly Slater (USA) and Mark Richards (AUS) with four Bells Beach wins each. He won his first in 2001 as a wildcard and then again in 2012 and 2014. The three-time World Champion also ties with Andy Irons (HAW), with both having 20 CT event wins. The first ever tiebreak Final puts Fanning on a path to his fourth World Title and he will take the gold leader jersey going into the third event on the Samsung Galaxy World Surf League (WSL) Championship Tour (CT) in Margaret River. Today’s match-up was the pair’s tenth in CT history, including three at Bells Beach, and Fanning has taken seven wins while De Souza has three. The Rip Curl Women’s Pro Bells Beach will likely run tomorrow (Thursday night SA time) and see a champion crowned. South Africa’s Bianca Buitendag (Victoria Bay) was eliminated in Round 3 earlier this week, finishing equal ninth overall. Event organisers will reconvene at 6:30 a.m. tomorrow morning (10.30pm SA time) to assess conditions and make the next call. The World Surf League (WSL) has announced the 2015 / 2016 Big Wave Tour (BWT) schedule that includes two new venues in Mexico and Oregon in the USA but excludes Cape Town, taking the total number of stops that will determine the WSL Big Wave Surfing Champion to seven. Dungeons, the open ocean reef near Hout Bay that has produced the biggest rideable waves on the African continent, has been removed from the schedule after the Cape Big Wave Trust (CBWT), a group that claims to include surfers from all over South Africa who regularly ride big waves in Cape Town, decided that they did not want the fully funded event to be run in at the break. After fully supporting the WSL’s offer of the multi million Rand event on last year’s schedule, which did not run due to a lack of suitably large waves, the CBWT members were upset by reports that the number of spots allocated for local surfers would be reduced from six to four this year. This, added to their claim that the BWT did not have a clearly defined criteria for local surfers to qualify to compete in events elsewhere, saw the local group vote to withdraw the Dungeons Challenge from the tour until there was greater clarity on how the BWT system operates. The BWT officials amended their offer to include six spots for locals plus a wildcard for this year’s Dungeons Challenge, which along with the inclusion of 2013/14 BWT Champion Grant ‘Twiggy’ Baker from Durban, who qualifies for all the events on the schedule due to his current No. 8 ranking, would have brought the South African contingent in the event to eight, or a third of the 24 man field. According to the CBWT, communications between WSL BWT Vice President Gary Linden, Contest Director Craig Jarvis and themselves lacked clarity and at their AGM the members voted unanimously that they did do not want a contest at Dungeons at this point. The decision provoked a digital media furor with many in the SA surfing community unhappy with the outcome, questioning both the CBWT’s motivation and its authority to make the decision. Baker, who would have stood to benefit the most from having a BWT event at Dungeons, which is virtually his home break, diplomatically voted and expressed his solidarity with the locals. But several SA based big wave luminaries were less accommodating with the likes of legendary Cape Town surfer and Dungeons pioneer Jonathan Paarman and Durban based watermen Jason Ribbink and former Dungeons champion John Whittle criticizing the CBWT decision as short-sighted, selfish and stunting the development of the emerging local big wave chargers by denying them the opportunity to meet, mingle and learn from the world’s best big wave exponents in their home surf without having to incur prohibitive international travel costs. One silver lining to the BWT announcement was the inclusion of Cape Town big wave charger James Taylor as one of the six qualifiers from last year’s #ProveIt Challenge. Taylor is joined by Trevor Carlson (HAW), Nick Vaughan (USA), Mark Mathews (AUS), Jamie Sterling (HAW) and Derek Dunfee (USA) with two of the qualifiers gaining entry at each stop on the tour. 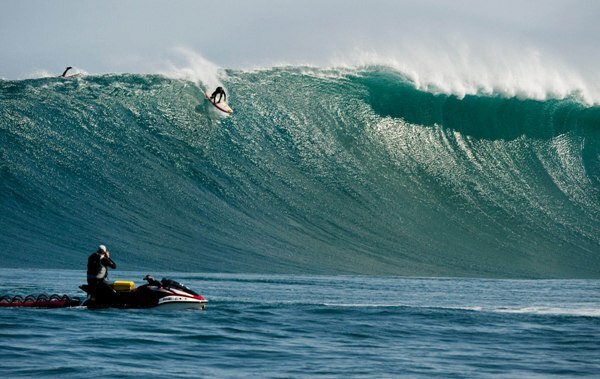 The 2015 / 2016 Big Wave Tour (BWT) will showcase the world’s premiere big wave surfers, the planet’s most harrowing venues and an unparalleled display of adventure, competitive drama and athleticism, all accessible at WorldSurfLeague.com. The acquisition of the BWT by the WSL will allow for top WSL surfers such as 11-time World Champion Kelly Slater (USA), three-time World Champion Mick Fanning (AUS), Hawaiian phenom John John Florence (HAW), amongst others to potentially join respected BWT surfers like Greg Long (USA), Grant Baker (ZAF), Gabriel Villaran (PER), Nic Lamb (USA) and Makua Rothman (HAW) in competition with waves in the 25-foot-and-above range. The BWT complements the WSL properties of the men’s and women’s Championship Tours, the Qualifying Series, Longboard and Junior Championships as well as the Big Wave Awards on May 1. 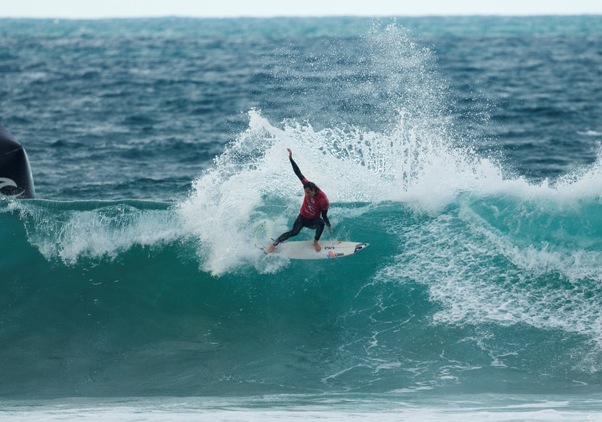 South African Jordy Smith won his opening heat and advanced directly to Round 3 of the Rip Curl Pro Bells Beach as organisers opted to run the first seven heats of the second stop on the 2015 Samsung Galaxy World Surf League (WSL) Championship Tour (CT) in one metre waves at Bells Beach in Victoria, Australia today (Wednesday). Smith, a three-time semifinalist at Bells, had to come from behind to overtake rookie Keanu Asing (HAW) and then staved off a late challenge from Adrian Buchan (AUS) as the 30 minute encounter wound down in the waist-high, crosswind surf at the Rincon section of the iconic Bells Beach line-up. WSL Commissioner Kieren Perrow put the event on hold after Smith’s heat. When conditions did not improve he ended the day’s proceedings without any further action. Earlier top seeds Kelly Slater (USA) and Gabriel Medina (BRA) won through Round 1 while Mick Fanning (AUS) suffered a shock defeat at the hands of wildcard Mason Ho (HAW). 11-time World Champion and four-time Rip Curl Pro Bells Beach winner Kelly Slater (USA) dominated his match-up with Sebastian Zietz (HAW) and rookie Ricardo Christie (NZL), using his experience to claim two 8-point rides, the highest heat total of the day. Reigning WSL Champion Gabriel Medina’s class and composure was the difference as the 21 year-old Brazilian locked in two good scores to take the win over two exciting up-and-coming Australians — 2014 CT Rookie Matt Banting plus trials winner Joe Van Dijk. Wildcard Mason Ho (HAW) secured an upset victory over defending event winner and former three-time World Champion Mick Fanning (AUS) and Freddy Patacchia Jr. (HAW). Ho landed a clean front-side aerial rotation to take the win and move directly to Round 3 while Fanning and Patacchia will have to surf again in elimination Round 2. With difficult wind and wave forecasts for the entire 12 day holding period, the organisers will gather at 6am local time tomorrow (approx 9pm Wednesday evening SA time) to decide on whether to get the competition underway. When competition restarts Michel Bourez (PYF) will be up against Nat Young (USA) and Dusty Payne (HAW) in Heat 8 of the men’s event. The Rip Curl Women’s Pro Bells Beach, which runs concurrently with the men’s event, sees South Africa’s Bianca Buitendag (Victoria Bay) taking on Malia Manuel (HAW) and (ZAF), Laura Enever (AUS) in the opening heat of Round 1. The Rip Curl Pro Bells Beach is webcast LIVE at WorldSurfLeague.com.